Tribus Gad nempe, ca Terrae Sancte pars, quae obtigit in partitione regionis tribui Gad. 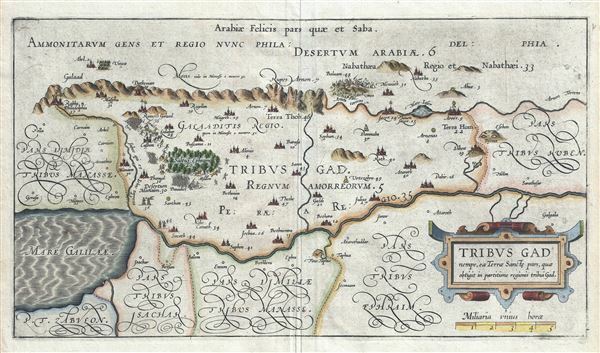 This is a fine example of Christian van Adrichem's rare 1590 map of the lands granted to the Tribe of Gad at the time of Joshua's division of the Twelve Tribes. The map is oriented to the east and covers from the Sea of Galilee and the River Jordan eastward into modern day Jordan as far as Nabataea. A number of important biblical sites are identified pictorially including the Saltus Ephraim or ephraim Forest where the fatal battle between the armies of David and Absalom (2 Sam xviii, 5) was fought, and the site of the prophet Balaam's meeting with the Angel of God (Numbers 22-24). Gad was part of the Kingdom of Israel until its lands were conquered by Assyria in c. 723 BC and the population deported. Since that time it has been considered one of the Ten Lost Tribes of Israel. This map is the frist of ten maps of the Holy Land prepared by Christian van Adrichem for publication in his Theatrum Terrae Sanctae. Adrichem's maps for the Theatrum were prepared between 1580 and 1585, but were published posthumously by his associate, Gerardis Brunius of Koln, in 1590. The publication went through several later editions and served as a basis for most subsequent maps of the Holy Land well into the 18th century. Very good. Original platemark visible. Blank on verso. Minor wear along original fold lines. Laor, E., Maps of the Holy Land: Cartobibliography of Printed Maps, 1475 - 1900, #11.